The summit of Crystal Mountain is 6,872 feet, and there is a Summit House Restaurant at the top. The first visitors to Crystal Mountain came in search of gold; prospectors flocked to the area, called the Summit Mining District, after gold traces were discovered there in the late 1800s. 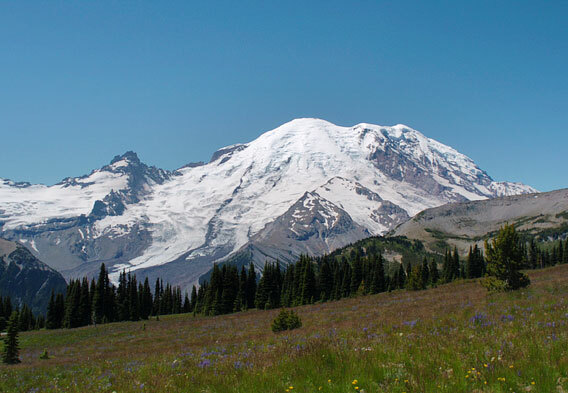 Washington State has more glaciers than the other 47 continental states combined. Mt Rainier has the fastest-moving glacier in the US, the Nisqually Glacier, which moves 16 inches per day in the summer. Crystal Mountain resort is a winter sports paradise located in Washington’s Cascade Mountains in the Mount Baker-Snoqualmie National Forest. It’s the largest ski resort in the state and home to Washington’s only gondola, and it’s one of the most popular outdoor sports destinations year-round—the many trails draw skiers and snowboarders in the winter, and hikers and backpackers come to see the wildflower meadows and stunning views in the summer. Located on the northeast corner of Mount Rainier National Park, Crystal Mountain resort officially opened in the early 1960s, but its history dates back about a dozen years beyond that. In 1949, a group of ski enthusiasts from all around the Puget Sound began to search for the best place to develop a dedicated ski area in the Cascade Mountains. After considerable research, they chose Crystal Mountain because of its reliable snowfall and the variety of terrain the mountain offered. After sending a proposal to the Forest Service in 1955, the Crystal Mountain Winter Sports Area was officially created in 1958 and officially opened for business in December 1962 with two double chairlifts and a limited number of trails—the area has grown immensely in the years since. Since the late 1990s, Crystal Mountain has flourished under the ownership of Boyne USA’s John Kircher, who began implementing a Master Development Plan in the summer of 1997. Since then, $30 million of capital improvements have resulted in great new features at the resort, including two high-speed six-passenger chairlifts. The brand new year-round Mount Rainier Gondola opened in January of 2011 and goes straight to the summit of the mountain. Crystal Mountain’s half a dozen peaks and basins receive an average of 367 inches of snowfall annually. Between the months of November and April, the park’s 2,600 acres, including 300 in-bounds backcountry acres, boast 57 named ski trails, ranging in skill level from Beginner to Expert. Its longest run, Northway, is 2.5 miles long and offers glade skiing. The parks eleven lifts have the capacity to carry 20,910 passengers per hour. One of the park’s most recent developments is the Sasquatch Jib Park, a playground for skiers and snowboarders who wish to perform jumps and tricks. Located on the 4,400 foot long Mr. Magoo run, this park offers approximately 30 fun features, including kinked rails, straight rails, boxes, bonks, stalls, pole jams, and butter pads of snow. Crystal Mountain offers its visitors everything they might need for a day on the slopes. Skiers and snowboarders can try out equipment in the Demo Shop before renting it. Lessons, camps and clinics are offered to all skill levels, including the Crystal Mountain Kid’s Club, adaptive programs for the disabled, and Freeride programs for expert skiers between the ages of 11 and 17. The new GO Card ticket program (https://www.tixforskicrystal.com/e-commerceWTP/) allows visitors to skip ticket lines by paying online. 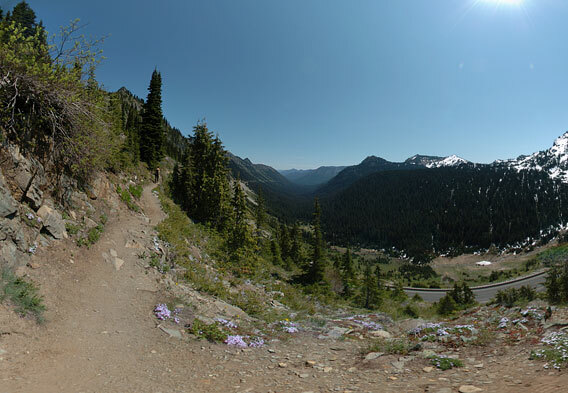 Between April and October, Crystal Mountain transforms from a winter wonderland to a summer playground as snow mounds are replaced with fields of wildflowers. One of the most popular things to do is to ride new Mount Rainier Gondola, which carries passengers 2,500 feet in less than ten minutes. At the top, enjoy incomparable views of the Cascade Mountains, or dine at Washington State’s highest restaurant, the Summit House. Wander the hiking trails on foot or on a guided horseback ride. Explore the lakes and waterfalls on the mountain biking routes and trails. Crystal Mountain’s proximity to Mount Rainier National Park makes it an excellent lodging option for the parks activities, as well. Hikers enjoy the Wonderland Trail, a 94-mile trail established in 1915 that goes around all of Mount Rainier. Between 200 and 250 people typically hike the trail each year, and it takes between ten days and two weeks to complete. The Wonderland Trail passes through lowland forests and subalpine wildflower meadows, and as hikers circle the peak, they can see the different faces of the mountain, which were carved by 26 glaciers. 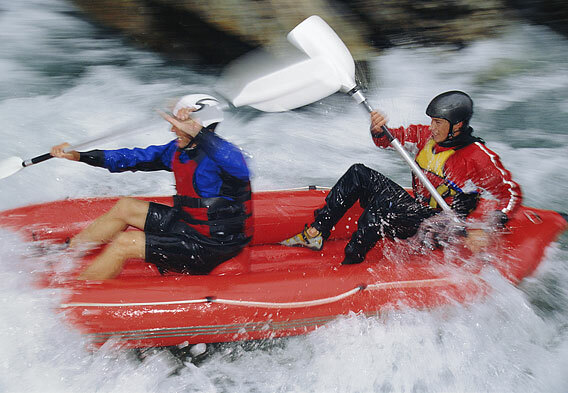 The park also offers excellent river rafting during the summer. The many paths of melting snow from the mountain provide a variety of river sizes, water speeds, and skill levels for rafting enthusiasts. There are rafting tours available along the Nisqually River, which is very family-friendly, as well as Tieton River rafting trips out of Yakima, and other options along the White River, Puyallup River, and others. Mount Rainier itself is one of the best-known attractions in the state of Washington, and it’s so close to the Crystal Mountain Resort that visiting is almost a must. Rainier is a large stratovolcano located 54 miles southeast of Seattle, standing at an elevation of 14,410 feet. The highest mountain in the state—and the largest in the Cascades—Rainier is popular among climbers as well. The most popular destination in Mt Rainier National Park, Paradise, is filled with wildflowers in the summer and often boasts record snowfalls in the winter. Paradise is about 50 miles from Crystal Mountain.